Flash may not be coming to the iPhone any time soon, but the developers of the popular language are now working on a way to help programmers easily convert their wares for Apple's popular handset. 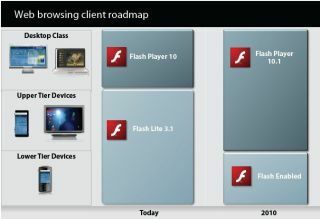 Adobe has failed thus far to persuade Apple that it should allow Flash onto the iPhone, despite many websites opting to use it as well as many other handsets. So, with Mohammed unmoving, the mountain has decided to announce a tool that lets programmers convert software apps from Flash to code that will run on the iPhone. "It's basically an export capability," said Adrian Ludwig, a manager with Adobe's Flash group, going on to explain why Flash is not on iPhones. "The ball is in their court at this point. We've been very blunt about what we need and what we are requesting," added Ludwig. A public trial version of the conversion software should surface later in 2009.